Michigan Victory Games | Sports By Ability. Not Disability. Michigan Victory Games gives athletes with physical disabilities a chance. A chance to compete, make friends, and feel the support of a team. To experience the thrill of victory and the possibility of defeat. To gain the kind of values, morals and skills that only sports can provide. To instill a belief and inspire greatness. To experience the spirit of competition we’ve provided for over 40 years. Join us, May 16- 19, 2019 (tentative) at Michigan State University for the Michigan Victory Games. Want to be part of the competition firsthand? View this video. It's more than just games. Want to get active as a volunteer? They have as much fun as the athletes. Almost. 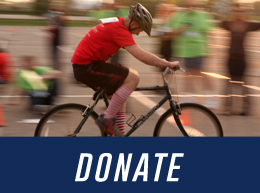 Every dollar raised benefits our athletes -- whether it goes towards equipment or to keep participation costs low. Ready to participate in the Michigan Victory Games? Register today to save your spot.